The color for the Rainbow Scrap Challenge this month was purple. I finished just under the wire. Purple is my favorite color, so I had a lot of scraps to work with. As I did with blue, I did a dark, medium, and light block. Blocks have not been trimmed yet. This puts me at 6 butterflies so far. The February color was brown, and I decided I wasn't excited about brown butterflies, so I skipped it. Over the weekend, I'll be linking up with Rainbow Scrap Challenge (even though the April color will be out by then) and Oh Scrap! Bonnie is Queen Bee for my hive of the Stash Bee. She asked for disappearing 4-patches in blues and browns and white. I had not done a disappearing block before, but have been considering a disappearing 9 patch for my long term to-do list. I enjoyed the 4-patch and really like how my two turned out. I also decided to hive crash another hive. Jane asked for cowboys or cows. She said any colors were fine, so I just had to make her a purple cow. I'm really loving the Stash Bee and the variety of blocks that people ask for! Cynthia over at Quilting is More Fun Than Housework has a fantastic idea. She's hosting a "Quilty Orphan Adoption" where people can offer up no longer needed patterns, supplies, or abandoned projects so other quilters can use them. I've given a few things away to my local friends in the past year or so, but it's always good to look at what I'm hanging on to. If you are interested in any of the following items, just leave a comment telling me which item or items you are interested in. I will take comments through 7pm Eastern time on Monday, March 21st and will select recipients the evening of March 21st. These are for give-away, I will pay shipping, and I do not have restrictions on your intentions. Patterns are available for international recipients, fabric items are US only due to shipping costs. This is a flannel panel to make a stuffed toy bear. All the directions are on the panel. Panel includes front of bear, back of bear, bow tie for bear, and a block. Bear as he is printed on the fabric is about 20" high, so figure he'll be slightly smaller when made. This is a completed quilt top, but it will need an edit. I made it when I first started quilting as a wedding present for a high school friend. Sadly, as sometimes happens with high school friends, we fell out of touch before I could finish it and give it to her. That was 1998/1999. The corner block is personalized and would need to be replaced. (I can give measurements for replacement block.) This was a very early quilt for me; blocks may not be perfect. It is scrappy. Not all fabrics are quilt shop quality and there are a few fabrics that are flannel mixed in with the regular cottons. It is shown on a Queen sized bed. How Charming pattern from Eleanor Burns' Quilt in a Day company. Pattern includes 2 sizes: table topper of 40" x 40" and lap quilt of 54" x 70". Reflections pattern from Gingham Girls designs. Pattern is for quilt 51" x 69". Image shown is of a two-colored quilt. Blue Ridge 1600 pattern from Cotton Dreams. This basically takes the Jelly Roll Race or 1600 pattern and makes it a little bigger. Size is 56" x 64" without borders; 80" x 88" with borders. I love I Spy fabrics. They've been my biggest fabric weakness for at least 3 years now. And though I've made several I Spy quilts, even 2 that live in my house, none have been for me. When I first saw this tutorial for an ironing board cover, I thought it would look awesome with my I Spy string scraps. My ironing board cover was super ratty, with a tear in the middle that keeps getting bigger, so the time was definitely right. I used a total of 42 I Spy strings, though the string on each end is pretty tiny, so it looks more like 40, with a floral I really like as the piece that goes around the edge. Three dimensional projects are far from my strong suit, so I was concerned about adding the elastic. It is far from perfect, but I'll be pretty much the only one using it and seeing it regularly, so I don't think that matters. I did have to buy the quilted ironing board fabric and the elastic especially for this project, but everything else came from the scrap bin. I keep my I Spy scraps separate from my "regular" scraps, so they are ready to be used for special projects. I was concerned that all the seams would make pressing on this cover difficult, but there is enough cushion in the quilted ironing board fabric that I don't notice the seams. 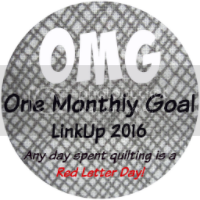 This was my OMG for March with Heidi at Red Letter Quilts (goal setting post #70). It was also on my list of Q1 goals for the Finish Along hosted by group of bloggers. 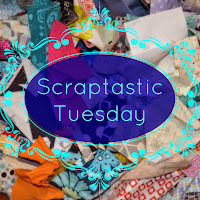 I'm also linking up with Oh Scrap over at Quilting is More Fun Than Housework, Scraptastic Tuesday at Mrs Sew & Sow (my first time! ), and Julie at The Crafty Quilter's Goodbye UFO extravaganza. My ironing board cover is super ratty. It's got a few scorch marks and the innards are showing through in one spot, and I think any padding it may have once had is long gone. I'm not usually up for more 3-dimensional projects, but I found this tutorial for an ironing board cover and I want to give it a go. I'm not a salvage fan, but I do have a bag of I Spy strings that I'm to use. Finishing the ironing board cover is my March goal for OMG hosted by Heidi at Red Letter Quilts.